Description of the South Beach vacation condo/Hotel Rental. 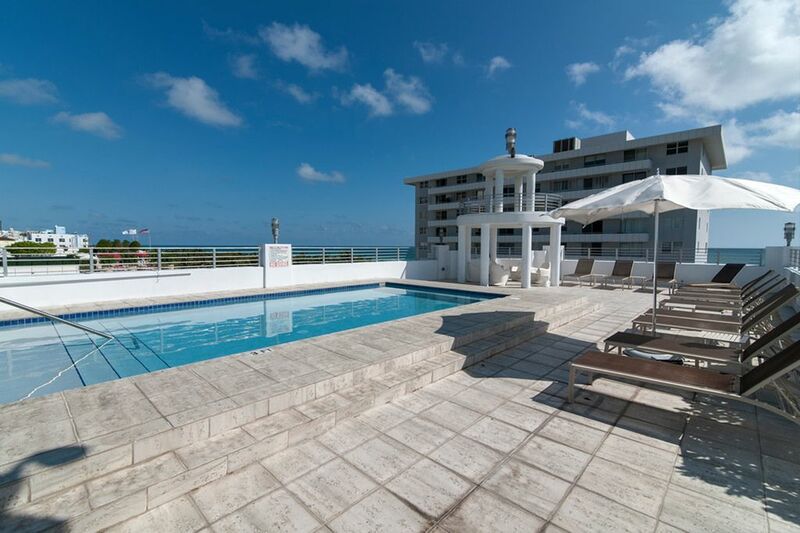 This Condominium is located across from Sand on famous South of Fifth in Miami Beach. Located directly on world famous Ocean Drive, this newly constructed, modern Oceanfront condo is literally steps away from the most famous restaurants and the world's best shopping experience on Lincoln Road. This Condo in addition to its finishing has a huge Terrace that overlooks the Ocean Dive and the Beach. Perfect for relaxation and entertainment. Walking Distance to all restaurants and shops on Ocean Drive, Washington, Collins Avenue and the famous Lincoln Road Shops. Luxury amenities include brand new modern furniture, gourmet designer kitchen, stainless steel appliances, marble floor bath with steam-shower, large flat screen TV, high speed internet, roof top pool, 2 balconies, beach towel service and more. Experience all that South Beach is known for, at a destination like no other. Comfortable and clean. Nice having separate bedrooms (with doors) and 2 full bathrooms. LARGE deck shown is private to condo 301! Pool is shared and not heated. No hot tub. Condo as described, but not stocked for cooking. Lacks basic pots, bowls and salt/pepper. Location is on Ocean, but far enough south that noise is not a problem. Steps to Walgreens, restaurants, beach and even bike rentals. A/C works well and host is responsive. Would recommend. We loved the location and amenities of the property. We will return. The property is within a short walk of the beach, restaurants and grocery stores. Plus for Uber people pick-up and drop-off is right of the property is just off where traffic starts to back up. The condo is beautiful , perfect for a weekend away. Spacious and clean , in a fabulous location , close to spa, yoga , fitness , beach , nightlife . Can’t think of anything we wanted that wasn’t available . Owner is responsive and so helpful . Este departamento ha sido totalmente renovado, es sumamente confortable y funcional. Esta ubicado en un lugar estrategico, practicamente sobre la playa sobre la Ocean, y ademas sobre la 5° que permite una salida sumamente rapida hacia todos los lugares turisticos de la region. Es nuestro lugar de Familia, ya son dos veces que hemos estado alli y seguiremos tomandolo todas las veces que vayamos a Miami. South Beach (SOFI) Gem - We've already booked for next year! The condo, the owner (Reza) and the neighborhood were sensational. The condo is in a new construction in the quiet and prestigious South of Fifth neighborhood, which is across the street from the beach and minutes away from amazing restaurants and the vibrant South Beach scene. The condo itself is exactly as in the pictures and the deck/balcony is huge (and gets the sun all afternoon). Reza was extremely helpful and available whenever needed - we've already booked for next year. Highly recommended. Walking Distance to Ocean, White sand, Long Beach, Shops, Ocean Drive, Restaurants, Lincoln Road, Roof top Pool, Music, Clubs (Prive, Cameo, Mansion), Nikki Beach, and Lounges.